for their advertising campaigns, and then somehow rapping on a McDonalds TV commercial, at age 25 Eric Sheinkop saw an opportunity to revolutionize the way brands and advertisers license and use music to drive broader marketing objectives. 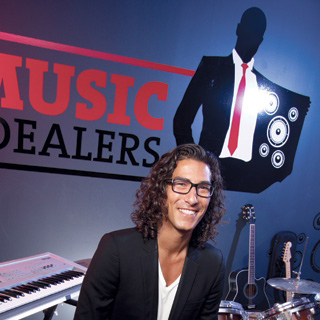 In 2008, Sheinkop created Music Dealers – a global music tech company that bridges the gap between bands and brands, enabling brands to create meaningful and authentic touch points with their target audiences and opening up a new route for emerging artists to gain the exposure, funding and distribution necessary to take their careers to the next level. With offices in Chicago, New York, Los Angeles, Atlanta, London and Mexico City, Music Dealers’ partners include the world’s leading brands, advertisers and TV and film production houses. Boasting the world’s largest music licensing database comprised of nearly 20,000 of the best indie musicians, Music Dealers has opened up a previously untapped global platform for the best emerging artists to share their music with the world through TV, radio, internet and live performance deals. In 2011, under Sheinkop’s leadership, Music Dealers cemented a groundbreaking partnership with The Coca-Cola Company, securing Music Dealers’ position as the organization’s global music partner and earning Coca-Cola a minority stake in the company. Later that same year, Sheinkop’s impact on the industry was recognized when he received a nod on Billboard Magazine’s “30 Under 30″ rising young executives who are driving the music industry forward, followed by being named “Music Man of the 21st Century” and included in “Crain’s Tech 50” list among Chicago’s other leading tech power players by Crain’s Business in 2012. Sheinkop is credited for his recent development of Social Empowerment – an industry-leading marketing approach that advises brands on how to leverage music most effectively, thereby enabling the brand to become useful to its consumers beyond product experience. His expertise on this topic landed him the opportunity to co-author the book Hit Brands: How Music Builds Value for the World’s Smartest Brands, published by MacMillan and hitting bookstore shelves Summer 2013.